The Pilates method is well known for its many health benefits including improved flexibility, muscle strength and tone. In particular, it is especially good at strengthening the core muscles of the abdomen and the lower back, buttock and hip muscles. At Healthy Options, we offer regular Pilates sessions alongside our Yoga and fitness classes. 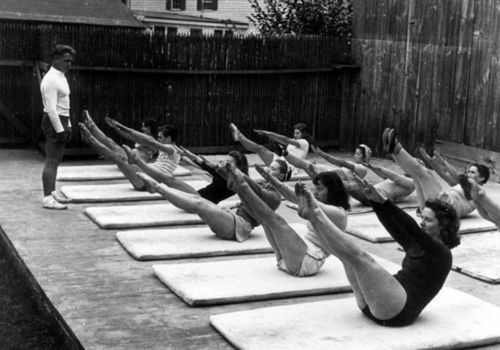 We thought you might like to know the story of how Pilates first began. As a young man, Joseph took up body-building and was committed to the sport; he transformed his body from frail to a robust, muscular physique that was used as a study for anatomical drawings. Joseph went on to devote his life to the study of how different forms of exercise benefit the body. He was the first to combine ideas from east and west to come up with a new type regime - a combination of the best of both practices. Joseph researched and practised every kind of exercise he could, ranging from classical Roman and Greek body-building and gymnastics, and the Eastern disciplines of Yoga, Tai Chi, martial arts and Zen meditation. Joseph was dedicated to the task, he sampled each kind of exercise and carefully recorded the results. Aged 32, Joseph left Germany bound for the UK where he applied all that he had learned from his studies and became a professional boxer, an expert skier and diver. Around this time he was invited to teach self-defence to Scotland Yard detectives, and he even worked for a time as a circus acrobat. All of these exploits were far from the imaginings of the frail young boy he had been. After the outbreak of the first world war, he was interned in Britain as an enemy alien and put to work as a nurse. He used this time to develop the first toning machines for bedridden patients to strengthen their muscles. In 1923 he moved to America where he set up his first studio, his new method was an instant hit with dancers who found Pilates the best way to recover quickly from injuries and to prevent their reoccurrence. From the day that Joseph opened his first studio, the popularity of the Pilates Method has spread steadily. Today Pilates is a worldwide phenomenon; it is practised around the world by millions of people including top athletes such as Andy Murray, Venus Williams and Victoria Pendleton. The five basic principles of Pilates are; breathing, pelvic placement, rib cage placement, scapular movement and stabilisation and head and neck placement. We focus on each of these principles in our classes at Healthy Options. Pilates can be modified to provide either a gentle strength training program or a challenging workout and it can be easily adapted to suit everyone from beginners to those who already exercise regularly. The mat-based classes at Healthy Options will help you develop core muscles and stability and has been proven to be an excellent form of exercise for improving posture and inner strength. The classes are 60 minutes long and with a choice of Level 1 (aimed at those new to Pilates) Level 2 (aimed at those with some experience) or All Levels. Classes run every day for six days.